← salted caramel chocolate chunk cookies. Well, if you’re gonna get real Southern and make yourself some shrimp and grits for dinner… you might want a nice, fluffy buttermilk biscuit to go along with your meal. You may recall that our dear friend Crist posted a while back about her not-so-successful attempt with biscuits – so, hopefully my tips and tricks in this post will help her out in future biscuit-making endeavors. 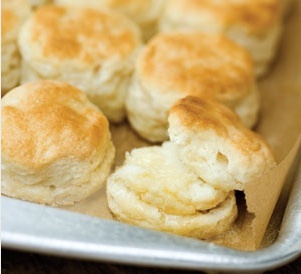 First, let’s talk about the best part of a biscuit – BUTTER. There are two things to remember here – you want your butter to start cold, and STAY cold, and you want the biscuit dough to still have nice (small) chunks of butter throughout. That cold butter distributed throughout the dough is part of what makes a light, fluffy, flaky biscuit – the hot air in the oven hits the butter, and the butter releases steam… which creates those delightful little nooks and crannys and pockets of air in your biscuit. Delicious! Second, let’s talk equipment. I firmly believe that you really don’t need anything that doesn’t already exist in your kitchen to make biscuits. You CAN use a food processor to cut your butter into your dough, but if you ask me, that’s just dirtying up a bunch of equipment that isn’t really all that helpful (and giving yourself LESS control over the dough itself). With most kinds of baking involving a type of bread, I often prefer to make my own dough by hand, rather than employing a food processor or stand mixer, so that I have control over the dough, and can use my hands to tell whether or not the dough is we enough/dry enough/incorporated enough/etc. It’s WAY easier to overwork a dough that is being made with an appliance, than one that is being made with your hands. That being said, there is ONE very inexpensive tool that will make your biscuit making endeavor much easier, and it’s called a pastry blender. If you intend to make biscuits (or scones) even sort of regularly, I’d highly recommend that you invest the money to purchase one of these bad boys (they should be about $8-10). Basically, it is used to cut the butter into the flour mixture – and it helps you do that evenly, and without inadvertently warming the butter by using your hands. 1.) Start by preheating your oven to 425°, and lining a baking sheet with parchment or a silpat liner. 2.) 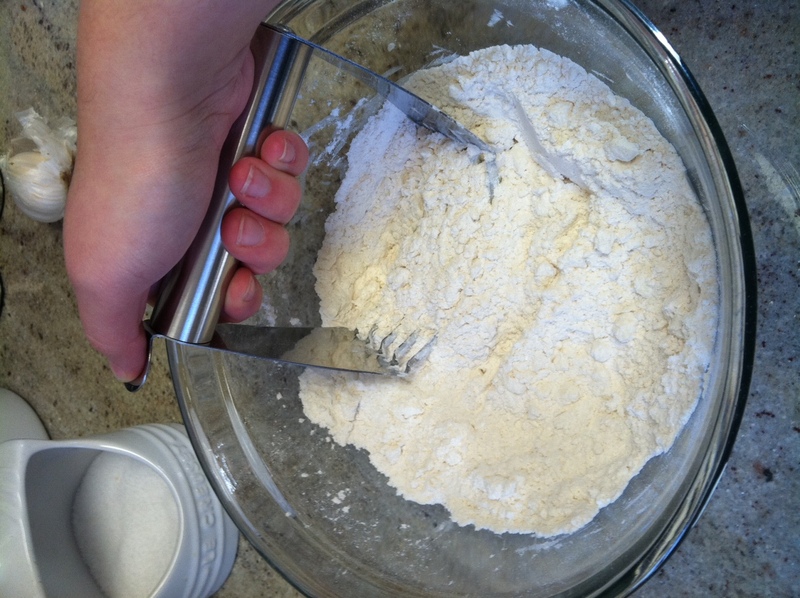 In a large mixing bowl, whisk together your flour, sugar, baking powder, baking soda, and salt, until well-combined. 3.) Drop your COLD butter cubes into the flour mixture, and lightly toss them with the flour, until they’re coated in the flour mixture. 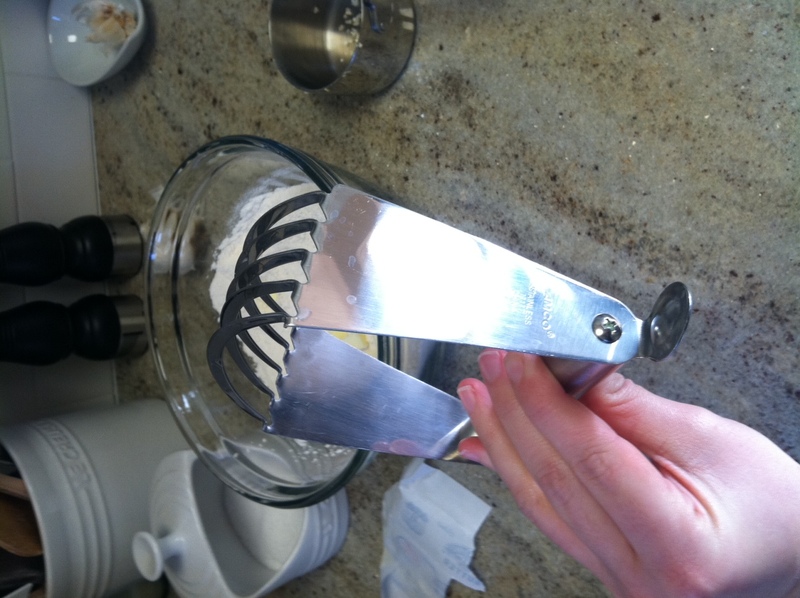 Alternately, you can also use two butter knives to do this step – just put one in each hand, and use them to cut in opposite directions through the flour and butter. This will also accomplish the task of cutting the butter into the flour. 5.) 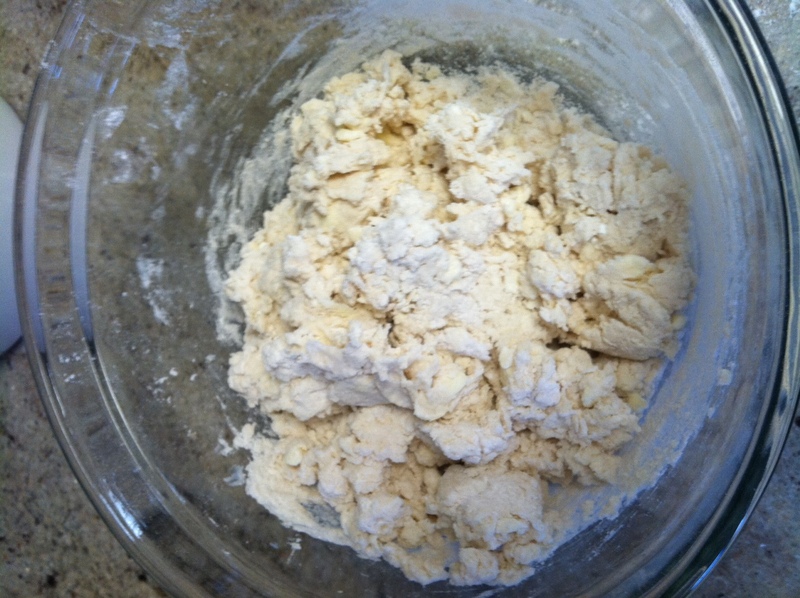 Once your butter and flour mixture is done, pour in your cold (well-shaken) buttermilk. Use a fork to gently fold the buttermilk into the flour mixture – it should come together quickly, and produce a very shaggy, wet dough. 6.) Liberally flour your countertop, and place your dough ball onto it. (I will tell you now, this dough is STICKY – it will likely stick to your hands like crazy. Just do your best to scrape it all off your hands and onto the ball of dough, then sprinkle some more flour into the top of the dough ball.) Very lightly knead the dough, just a few times – all you want to really do is fold the dough over onto itself a couple times, until it comes together into a mostly smooth shape, adding small amounts of flour if necessary. Remember, you want the butter to stay COLD, so the less contact with your (warm) hands, the better! 7.) 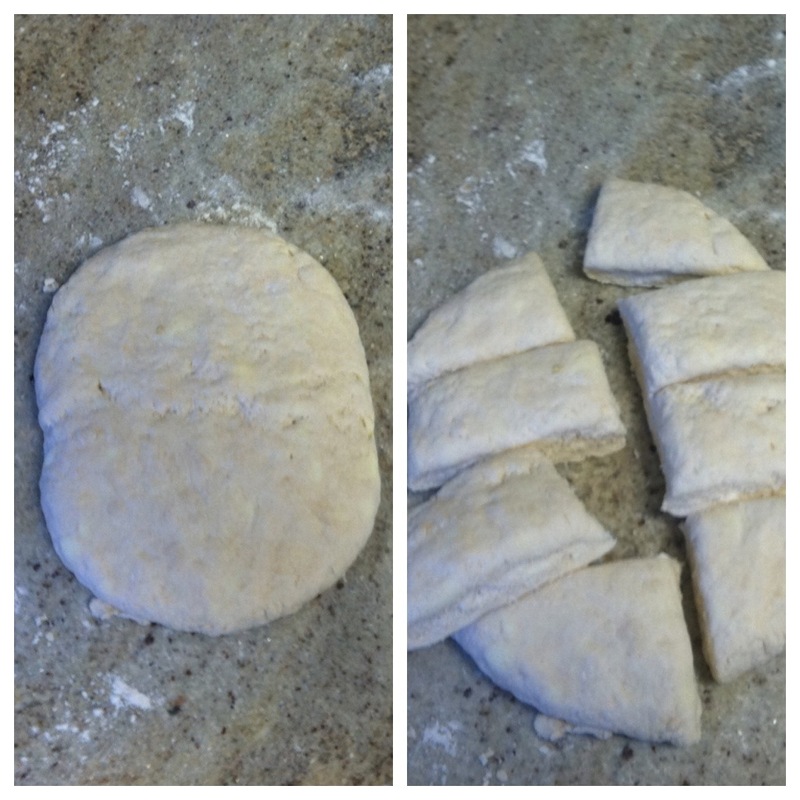 Once the dough has come together, pat it into either a flat disk or a flat rectangle shape, about 1/2″ to 3/4″ thick. Again, work quickly, and touch the dough as little as possible! 8.) Using a bench scraper or a knife, cut the dough into 8 equal(ish) pieces, and place them onto your prepared baking sheet. Bake for about 12-15 minutes, or until the biscuits have risen nicely and turned golden brown. They should be have doubled or tripled in height, as well. That’s it! These biscuits are SO delicious – light, flaky, with a slight crunch to the outside. I prefer them just split in half and spread with butter, but they’d also be delicious for a breakfast or brunch with some jam on them – or covered in gravy, if that’s your thing. 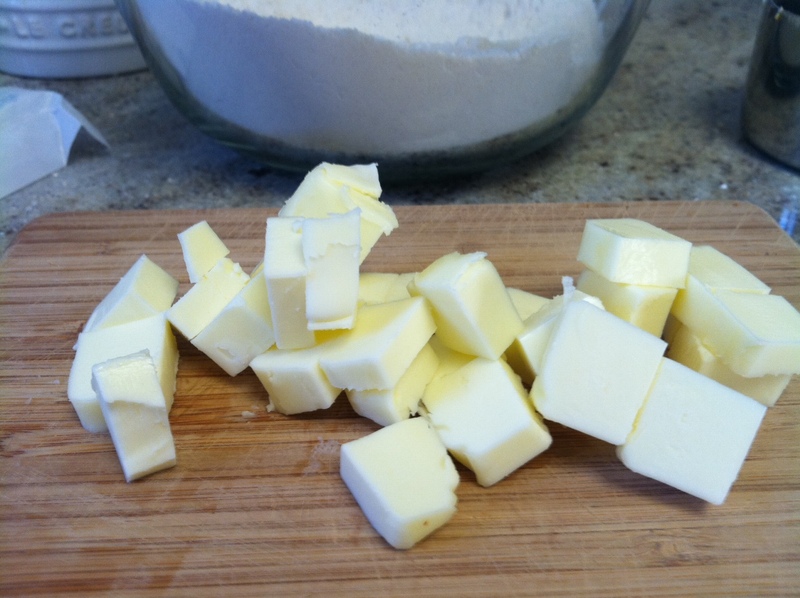 – only cut the butter in until the chunks of butter are the size of small peas – no further! and you know, my biscuits looked JUST LIKE that last picture. i just didn’t want to show up the internets. Perfect sign off. I look forward to messing up this recipe in the near future.